You’ve never had a chicken salad quite like this! 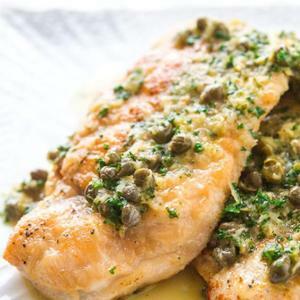 Poach the chicken breasts: Bring the chicken stock to a simmer and add the chicken breasts. Add some water if there is not enough liquid to cover the meat. Simmer gently for 10 minutes, then turn off the heat. Heat paprika in olive or walnut oil: Meanwhile, heat the olive or walnut oil in a small pot over low heat and add the paprika. Stir well to combine. Heat until you can smell the aroma of the paprika, then turn off the heat. 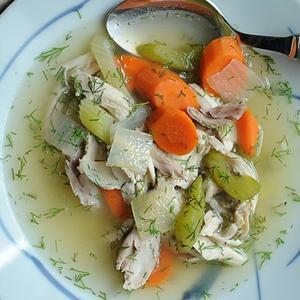 Soak bread in broth: Tear the bread into chunks and put into a bowl. Ladle out about a cup or two of the chicken broth and pour it over the bread. 4 Make walnut paste: Put one cup of the walnuts into a food processor. Add the garlic, the cayenne, about a teaspoon of salt, 1 Tbsp of the parsley and the soaked bread. Pulse to make a thick, relatively chunky paste. If it needs a bit more chicken broth to loosen up, add some a tablespoon at a time. Stir the paprika-oil, then pour it into the food processor and buzz to combine. Add salt to taste. 5 Assemble the salad: Tear the chicken breasts into shreds. Put it in the bowl with the remaining 1/2 cup walnuts, the green onions and 1 Tbsp of parsley. Add the walnut-paprika paste from the food processor to the bowl and stir gently to combine everything thoroughly. Add black pepper and lemon juice to taste. 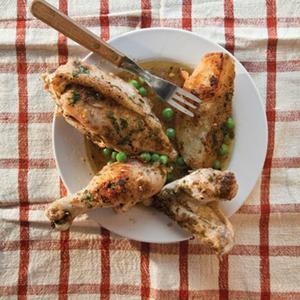 A delicious take on Chicken!